I’m in RAC database (10gR2/Redhat4). I need to store the real CPU wait every 1 minute in a table for a month. For that I thing to query the GV$SYS_TIME_MODEL [for the “DB CPU” statistic]. This is a very difficult question to answer. Why (additional reference)? Technically, in Oracle when a session is “on the CPU”, that session is not in a wait event, and therefore not officially waiting for anything. The “DB CPU” statistic captures the accumulated time spent on the CPU by foreground processes – the user sessions. This CPU time does not include the time that the background processes (DBWR, LGWR, PMON, etc.) spend consuming CPU time. Additionally, the “DB CPU” statistic does not consider/accumulate CPU time consumed by processes that are not related to the database instance. It could also be said that the “DB CPU” time does not account for time that the session spends waiting for its turn to execute on the CPUs. To determine the number of seconds of CPU time consumed, the values shown in the DB_CPU and BACKGROUND_CPU columns should be divided by 1,000,000. Why not just use AWR data to obtain this information? Just because AWR is built-in does not mean that it is free to use the features of AWR (as I attempted to argue in this OTN thread) – this is a fact that is often glossed over by various books, blog articles, “news” articles, and even the Oracle Database documentation when it states that AWR reports are the replacement for Statspack reports. No wonder it crashed with an ORA-07445 Access Violation error – look at the first argument of the __PGOSF480_upduaw+158 calling location – it must be that fatal errors appear in Oracle whenever the hexadecimal number DEAD appears in the middle of an argument. 🙂 (Watch out for false correlation when troubleshooting.) In case you are wondering, Metalink Doc ID 175982.1 “ORA-600 Lookup Error Categories” does not describe the updgrh function that eventually lead to the crash in the _intel_fast_memcpy.A+18 calling location, but there are a couple of articles on Metalink that describe updgrh as a function that is involved in updates to migrated rows. The above output is obviously not from the 10.2.0.4 database. As can be determined by the above, the _OPTIM_PEEK_USER_BINDS parameter is set to FALSE only for the program AAAAAAAA. If you look closely at the output, you will also notice that the _OPTIMIZER_ADAPTIVE_CURSOR_SHARING parameter is set to the non-default value of FALSE for both sessions (this change was made in the spfile), and it would be a logical next step to determine why that hidden parameter was changed from the default. Did changing the behavior of bind variable peeking solve the ORA-07445 Access Violation error? Well, that question is off topic for this blog article – the ORA-07445 is just one reason why it might be necessary to explore the parameters that were modified at the session-level. V$SES_OPTIMIZER_ENV shows the parameters that were modified from the Oracle defaults (check the ISDEFAULT column) at the session-level, and those values may be compared with the system-wide defaults found in the V$SYS_OPTIMIZER_ENV view. A previous blog article described the V$SQL_OPTIMIZER_ENV view, which shows the parameters that were in effect when a specific child cursor was initially hard parsed. Eliminating 2 Wait Events from the Top 5, How Many Remain? How many wait events will appear in the top five wait events for a selected time period (hint – something has to appear in the top five)? When the two most commonly found wait events are eliminated from the top five, does that necessarily mean that the database performance is better, or could the performance be worse? If the above two events are in top 5 events then what could be the reason for this and how to resolve the issue? What Oracle release and operating system platform is in use? How many seconds of wait time were reported in each of the wait events? What was the total duration of the statistics collection period? Were there any other, potentially more significant wait events in the top five list? 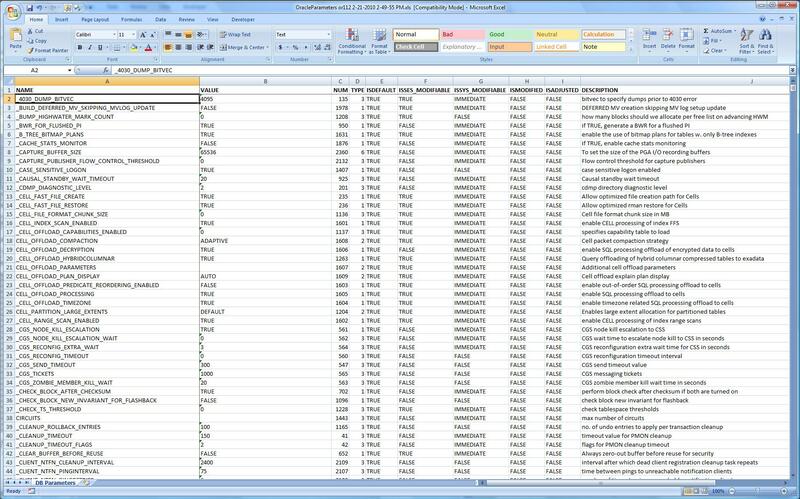 How many users were connected to the database? What was the average wait duration for each of the events, and how many waits? Were any business critical processes operating at a slower than expected speed? The are a large number of initialization parameters that configure the behavior of an Oracle database instance, and it seems that the number of hidden parameters (those parameters that begin with _ ) continues to grow with each new Oracle Database release. In some cases, parameters that were once normal parameters became hidden parameters in later releases (the SPIN_COUNT, and _SPIN_COUNT parameters are one example). In other cases, the normal parameter defines the minimum requested parameter value and the hidden parameter defines the current value (DB_CACHE_SIZE and __DB_CACHE_SIZE parameters, respectively). Unfortunately, we have a slight problem. The SQL statement in the script must be executed as the SYS user, and if the O7_DICTIONARY_ACCESSIBILITY initialization parameter is set to FALSE (the default starting with Oracle 9.0.1), the normal connection string used in previous scripts will not work (I have not found a way to pass AS SYSDBA when Provider=OraOLEDB.Oracle is specified in the connection string). If you do not want to set the O7_DICTIONARY_ACCESSIBILITY initialization parameter to TRUE, you will need to create an ODBC connection to the database. 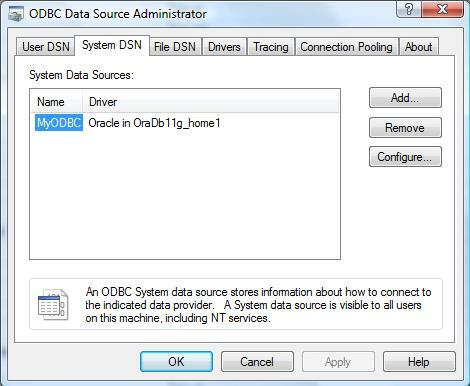 Pick a generic name for the ODBC connection, such as MyODBC (this is the name used in the script) and then enter the database name from the Tnsnames.ora file into the TNS Service Name box (I specified or112) – note that you can change this database name at a later time to point the script at a different database. Click OK.
dbDatabase.ConnectionString = "Data Source=" & strDatabase & ";User ID=" & strUsername & ";Password=" & strPassword & " AS SYSDBA;"
strSQL = strSQL & "  UPPER(NAM.KSPPINM)"
.Selection.NumberFormat = "mm/dd/yy hh:nn AM/PM"
objExcel.ActiveWorkbook.SaveAs "C:\OracleParameters " & strDBNAME & " " & Replace(Replace(Now, "/", "-"), ":", "-") & ".xls"
When the script runs it will create a spreadsheet in the root of the C:\ drive – move the spreadsheet as needed for documentation purposes. 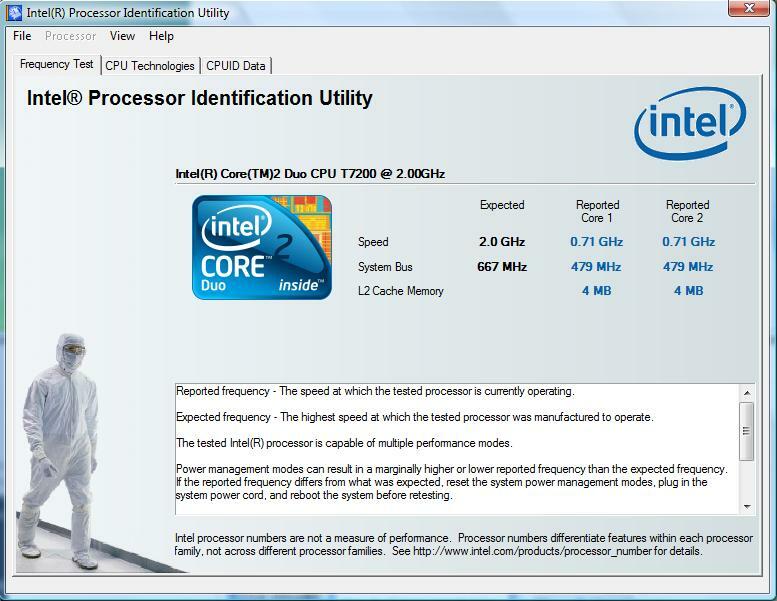 CPU Usage Monitoring – What are the Statistics and when are the Statistics Updated? As mentioned in Chapter 8 of the “Expert Oracle Practices” book, there are several ways to measure the amount of CPU time used, whether at the operating system level, at the instance-wide level, at the session level, or at the SQL statement level. In a previous blog article I described why driving the database server’s CPUs to 100% utilization was a bad idea and provided quotes from several articles that disagreed as well as several that agreed with my statements (Cary Millsap’s follow-up comment should be read carefully). CPU used by this session: Amount of CPU time (in 10s of milliseconds) used by a session from the time a user call starts until it ends. If a user call completes within 10 milliseconds, the start and end user-call time are the same for purposes of this statistics, and 0 milliseconds are added. A similar problem can exist in the reporting by the operating system, especially on systems that suffer from many context switches. When are these statistics updated? If the CPU used by this session statistic is updated in real-time (if you are wondering, it is Not), the CPU used when call started statistic could be used to determine how long the session has been on the CPU (and not in a wait event and not in one of the other CPU run states), but if the statistics are not updated in real time, what is the point of having two separate statistics? What is considered a user call – is it the full execution of a user’s SQL statement, or is it a fetch of a block from disk, or is it the completion of a fetch of some of the result rows, or is a user call something entirely different? We need a test case to see what is happening with these statistics, and several of the other statistics that measure CPU utilization (warning, this test table may take an hour or longer to create). In the above script, repeat the three SQL statements (replacing 552 with the SID number returned by your query) between sets of host sleep 60 calls as frequently as required, possibly 30 times, so that the full run of the SQL statement that will be executed by the first session is captured (see page 213 of the “Expert Oracle Practices” book for a Windows equivalent of the Unix/Linux sleep command) . The index hint is added in the above just to make certain that the IND_T1 index is used when we select 1.27% of the rows from the test table. Start the monitoring script in the second session and immediately start the above script in the first session. 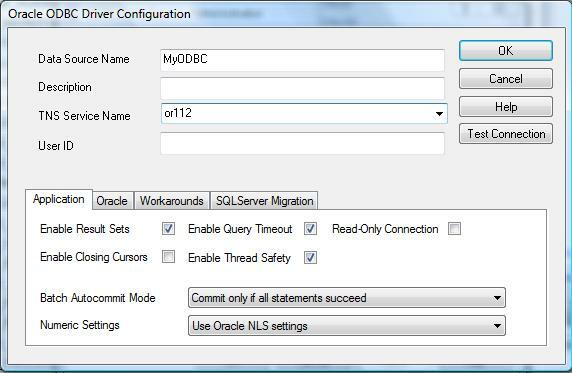 As evidenced by the above, the SQL statement completed in just less than 10 minutes in Oracle 11.2.0.1, while the SQL statement in 11.1.0.6 completed in just less than 4 minutes. Why the significant time difference? Maybe the above stats provide a clue? The DB CPU statistic in the V$SESS_TIME_MODEL view and the various statistics in the V$OSSTAT view are updated in near real-time – the monitored session only consumed about 0.6 seconds of CPU time for every 60 seconds of execution time. You will notice that for both Oracle Database 11.2.0.1 and 11.1.0.6 the delta values for the CPU used when call started statistic and the CPU used by this session statistic appear as something other than the number 0 throughout the execution time, so the statistics must be updated at least once a minute in this test run, but that appears to contradict the results shown in Table 8-1 on page 201 of the “Expert Oracle Practices” book where those statistics were only updated 5 minutes and 35 seconds after a SQL statement was submitted (in the book, the CPU used by this session statistic was updated to show only the parse CPU time, until 5 minutes and 35 seconds elapsed). Is the book wrong, or are the above statistic deltas wrong, or maybe there is another explanation? There were roughly 13 fetches in the first minute, roughly 15 fetches in the second minute, 14 fetches in the third minute, etc. The statistics in V$SQL are updated at least once every 6 seconds, so the displayed CPU time values (shown in seconds) are reasonably close to actual CPU consumption times. You might recognize that the above CPU Time delta values are very close to the delta values shown for the CPU used by this session statistic, so does that mean that the CPU used by this session statistic is updated every 6 seconds or less? That brings us back to the question, what is considered by the documentation as a “user call” in regard to these two statistics? Given the above evidence, a “user call” in this context actually includes fetch calls. Because of the inconsistency with which the CPU used by this session statistic is updated (it might not be updated for more than an hour while executing certain SQL statements), it is a better idea to use the DB CPU statistic found in the V$SESS_TIME_MODEL view (available starting with the Oracle 10.1 release) when trying to determine how much CPU time a particular session is consuming. Of course operating system tools such as ps and top or my VBS script for Windows may also be used to determine which sessions are consuming CPU time. The V$SESSION and V$SESSION_WAIT views are also able to help you determine which sessions are currently consuming CPU time and roughly how much CPU time has been consumed since the last wait event ended. But a parallel question remains, why is a particular session consuming CPU time (the above test case is not necessarily the best example for showing uncontrolled CPU usage, try this test case with the OPTIMIZER_FEATURES_ENABLE parameter set to 10.2.0.4 or lower at the session level)? The V$SESSION_LONGOPS and V$SQL_MONITOR (introduced in Oracle 11.1, requires a Tuning Pack license to access) views might provide enough information to determine why a session is consuming CPU time. A 10046 extended SQL trace could also potentially show why a session is consuming an excessive amount of CPU time, unless, of course, nothing is written to the trace files because the session is performing a CPU intensive operation completely in memory. What then? Multiple ORADEBUG SHORT_STACK traces (there is a small chance that creating one of these dumps will crash the session) for the session with the help of Metalink Doc ID 175982.1 could provide a clue of what is happening in the session. If that does not help find the cause of the CPU usage, you could just declare that the Oracle Wait Interface is Useless (Sometimes) and move along to something more productive (I suggest reviewing that blog series). Is Intel trying to strong arm me into buying one of those Core i7 920QX laptops, or is Microsoft trying to get me to upgrade to Windows 7 on this laptop? Sometimes predicates can be generated due to Transitive Closure, but is it possible to see below mentioned behaviour. Is it possible to create test case for observing this behaviour? You can even have cases like this one: if n1 > 10 and n1 < 0, then 0 > 10, which is always false, and therefore can short-circuit an entire branch of an execution plan. 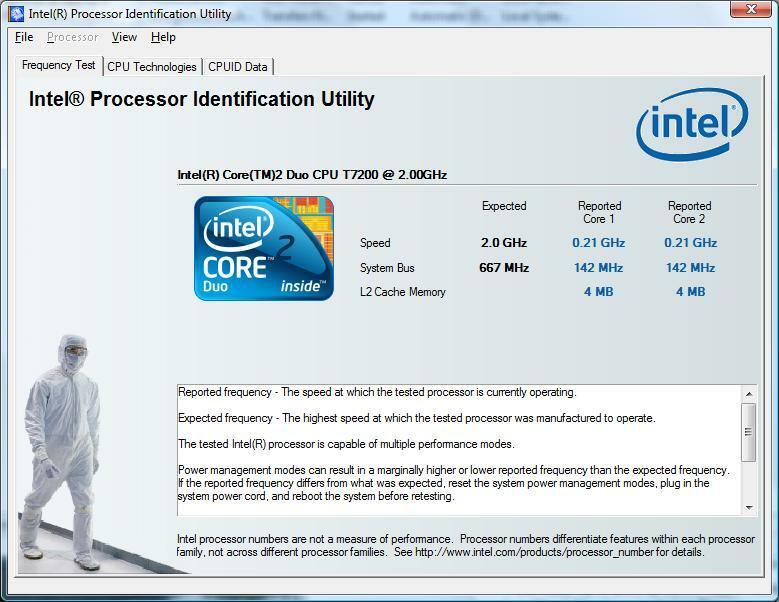 What is the Meaning of the %CPU Column in an Explain Plan? The above command wrote a couple of rows into the PLAN_TABLE table. At this point, we should probably consult the documentation to understand the columns in the PLAN_TABLE table. COST: Cost of the operation as estimated by the optimizer’s query approach. Cost is not determined for table access operations. The value of this column does not have any particular unit of measurement; it is merely a weighted value used to compare costs of execution plans. The value of this column is a function of the CPU_COST and IO_COST columns. IO_COST: I/O cost of the operation as estimated by the query optimizer’s approach. The value of this column is proportional to the number of data blocks read by the operation. For statements that use the rule-based approach, this column is null. CPU_COST: CPU cost of the operation as estimated by the query optimizer’s approach. The value of this column is proportional to the number of machine cycles required for the operation. For statements that use the rule-based approach, this column is null. The above indicates that the %CPU column should show the number 4 on both rows of the execution plan. 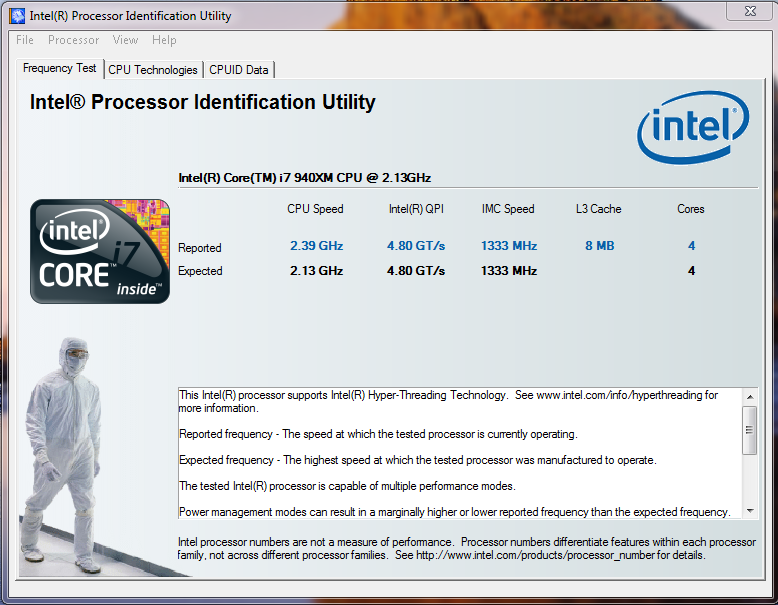 Is there anything strange about the %CPU column in the above plan?